The French are well known for their love of all things “Roller”, so it should come as no surprise to discover that the biggest and most well-loved skate event in Europe is the 24hr du Mans Roller – known simply as “Le Mans” to the UK skating community – held each year at the prestigious Le Mans Bugatti circuit in the Sarthe of France. Each year, skaters across France and much further afield make the annual pilgrimage to do this unique race – some competitively, others in a more relaxed fashion, all for the simple love of skating. London teams have been attending the Le Mans race every year in increasingly strengthening numbers since a small contingent first went in 2002, and this year saw more UK/London-based teams and skaters than ever before make the short trip across the channel, with conservative estimates of 90 skaters and an entourage of 30 or 40 additional pit crew members. Some drove over, some took the ferry, others took the EuroStar… all congregating towards this mecca of skating. From humble beginnings do such cherished traditions grow. The skate teams come in many sizes and categories – anywhere from full 10-man “Prestige” teams, 5-man “Endurance” teams, as well as the crazy Duos and Soloist, with equivalent “Female-only” and “Veteran” categories, as well as several niche categories such as “Student” and “Business” – almost 500 teams in total, comprised of thousands of individual skaters. The London group this year comprised of 7 Prestige teams, 3 Endurance teams, 1 Duo and 2 Soloists. Although the race is “only” 24 hours over one weekend, the amount of organisation, training and preparation involved are huge, and the wheels set in motion many months in advance bear testament to how highly regarded this event is on the annual skating calendar. Starting position is determined by a qualification event at 2pm on the Saturday where one skater from each team completes a 300 meter sprint. The race itself begins a couple of hours later at 4pm, where a starter from each team dashes across the track in their socks (or sometimes just their bare feet! ), jump into their skates lying a track’s width away, quickly buckles up (mimicking the traditional start of the 24hr car race) and sets off to launch their team’s race effort. After two laps you are allowed to relay to other members of your team as you wish, and from there on until the 24 hrs are up the aim is to complete as many laps as you can, with the team that completes the most distance at the end declared the winner! The Le Mans Bugatti circuit is a 4.2km racetrack – its great defining feature from the point of view of a skater is a hill at the start of each lap- a long gradual climb over 700 meters, at the crest of which stands the famous “Dunlop” bridge. From there it is a steep right-hand downhill where you can build some serious speed, some further long sweeping corners around the back of the circuit, onto the long back straight, followed by another couple of corner complexes, before finally coming back around to the start/finish. A lap of Le Mans can take anywhere from 6 minutes for elite skaters going flat out, to double or triple this time for us mere mortals, and is also dependent on factors such as tiredness and being lucky enough to pick up a good draft from a paceline on your way round. To put this searing pace into perspective, consider that a typical LFNS is the equivalent distance of 4 or 5 Laps and would be completed in under 30 minutes by the elite teams! One lap of Le Mans is pretty tough – to do it over and over again turns it into a huge personal challenge for anyone. As the race progresses on into evening and eventually the small hours of the night, teams usually execute a shift pattern so that some members can go off to get some extended rest, leaving a few other lucky team members to continue to put in the laps and keep things ticking over. How you approach the race and your shift strategy is largely determined by how many members are in your team – the fewer members on your team, the more laps you will have to skate and the more your aim switches from flat out speed to endurance. 24 hours of skating as fast as you can in a team of 10 is quite a challenge for anyone, but spare a thought for our Soloists (Richard & Chris) and Duo team (Markus & Ben) – these guys were truly setting out to test their physical and mental boundaries, with months of hard training behind their efforts. As well as a just a personal battle and skate race against other teams, Le Mans is a also battle against the physical elements: high winds, stifling heat and torrential rain have all been known to throw a spanner in the works, and you have to be prepared for all eventualities. This year was no different, with temperatures dropping to near zero overnight, meaning that if you weren’t skating then you were freezing and just trying to keep warm. These are the toughest hours of the race – with such a long way to go until morning, never mind the end of the race, spirits can easily sag. One must just grit their teeth and focus solely on doing their next lap. Eventually there is a light at the end of the tunnel – or rather at the top of the hill – as daybreak eventually arrives. For an hour or so the skaters are rewarded for their climb up Dunlop hill with the glorious sight of sunrise and the breaking dawn, as the race moves on deeper into its 2nd half. There is still a long way to go, but the sight and feel of a new day provides everyone with the mental lift they need to keep on going. 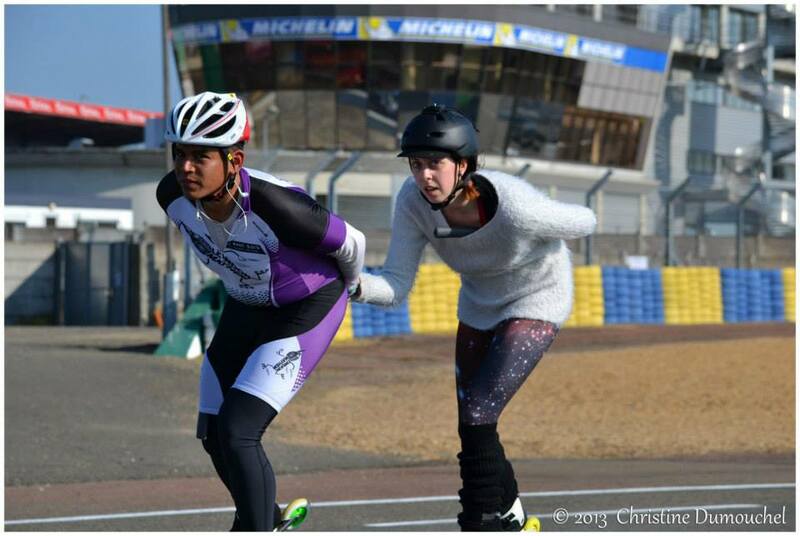 One of the great things about skating at Le Mans is the high probability of encountering other familiar skaters around the circuit, as the faster teams and skaters are continually lapping the slower ones. It’s a chance to exchange shouts of encouragement, or even to work cooperatively together for a while by taking advantage of a draft or giving a gentle push from behind as you match strides – two or more skaters working together can go much faster than both going around individually. It also means that just as you are continually over-taking less able skaters, you are also continually being lapped by the faster ones, including some of the very best in the world – there are not many other events where you momentarily occupy the same piece of track as the world champions while they skate past you. If you have any appreciation for the hypnotic beauty of an efficient speed skating stride, you will never grow tired of the awesome sight of the elite skaters breezing past with such good form and technique that they make it look so effortless. Early morning saw a layer of fog descend on the circuit, and for a couple of hours everyone had the extra challenge of much reduced visibility and a slippery track surface to contend with. Baton changeovers would prove particularly challenging, as it was impossible to spot your incoming skater until they were bearing down almost on top of you. However, the race relents for no one, and everyone bravely soldiered on as the morning sun eventually burnt off the clouds to provide us with glorious skating conditions for the final leg of the marathon event. By this point, one of the London teams, the London Galactics, who had been duelling with a couple of other teams for the podium positions in their category, had managed to overturn a lap’s deficit after gradually reeling their rivals in overnight, and had now managed to eke out a small but significant lead. This was generating a huge amount of collective excitement throughout the pit boxes where the London teams were operating from – a potential podium positions at Le Mans is a big deal for anyone. Into the final few hours for the race, and the atmosphere cranks up to a fever pitch as the lap counter inexorably ticks up and the 24hr time limit inexorably counts down. The pace of the music and race commentary blasted out across the PA system steadily increases in both volume and tempo as the end approaches. Everyone is tired, skaters and pit crew alike – many have not slept or pushed themselves to skate more miles than they will have ever thought possible. The last hour is a triumphant party atmosphere – everyone jumps onto the pit wall to cheer on their teammates, or climbs up into the main stand where they can watch the finish of the race from a spectacular viewpoint. The race finally finishes at 4pm on Sunday, and all the London teams cross the finish line in unison, having slowed and waited for each other on the final lap, such is the camaraderie on display, to collective cheers from their friends and teammates. The racing is finally over, but the stories and the memories will last a long time. Every skater has been inspired by someone else, and everyone is already formulating plans in their mind to go back and next year to go further and faster. The London Galactics were triumphant in their category – an astounding feat, and a first for ANY team from the UK, but everyone who took part can justifiably feel like a hero. It’s a feeling that you won’t find anywhere else that makes it so special. That’s when you know that you have the Le Mans bug. See you all in 2014!